The Heyfield Market is on the first Saturday of every month - 8:00am to 1:00pm. Heyfield Saturday Market is a variety market including plants, jewellery, cakes, trash and treasure plus much more. 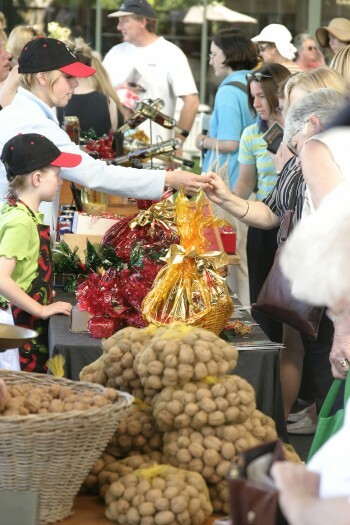 Heyfield Saturday Market has a relaxed and friendly atmosphere with over 28 stalls of home made, home grown and quality second hand goods (trash & treasure), as well as honey and potatoes. Enjoy a barbecue or Devonshire tea, sandwiches and cakes. The market raises money for the St James Anglican Church. It is held at John Graves Memorial Park on the first Saturday of each month. In addition to the market the Heyfield Historical Museum is also open every market day from 10:00am to 2:00pm located just through the crossroads from the market on Harbeck Street. It houses an array of local information and memorabilia from the late 1800's to more recent times. Take the Princes Highway (M1) to the outskirts of Traralgon. Turn left onto C105 (Traralgon-Maffra Rd) to Heyfield (44km), passing through Glengarry (9km), Toongabbie (20km) and Cowwarr (32km).